If you are not aware of PlanetX bikes, then you are probably not into bicycles and you should probably skip this blog entry entirely. If on the other hand you are aware of them, then I probably do not need to tell you much about the company, because you probably already know. I’ve been riding mountain bikes for a long time, probably 15 years or so, the last mountain bike I had was a home-brew bike that was literally made out of discounted parts from local bike shops and the internet. It had a 2×10 Shimano XT drivetrain and very high end, but previous year components. It was fast and fun to ride. It was also a 26’er, which in modern terms means that it was archaic and not worth bothering with. I disagreed. Earlier in the year PlanetX had a sale – again if you know them, this is absolutely nothing new, they are always selling something cheaply. I took advantage of the cycle-to-work scheme and snagged a 45650B with pretty much every option maxed-out within the limits of the scheme. The pre-sale price was something over £2000, talking off the VAT and making the payments pre-tax I will end up paying way under £1000. The name 45650B comes from the bikes ability to run 4, 5 or 6 inches of front travel and 650B wheels 4-5-650B, get-it ? Configuring it was hilarious, ‘would sir like a dropper seat-post’, oh, yes please ! Would Sir like the upgraded brakes ? Obviously, and the ? check, check, check, check, double-check. The only things I did not upgrade were the saddle and the handlebars. Honestly I probably should have done, but I wanted to ride it before I committed to changing the touch points. In hindsight, the saddle is terrible and the bars are a tad wide for me. The bars are an easy fix, the saddle less so. So, what did I get for my money then ? A steel framed, hard-core trail monster ! I had a chance to ride the Olympic mountain bike course this morning. This was the first decent ride I have had on it – most of the other rides have barely been off-road – for that use I prefer a road bike. But this morning any road bike would have been a long way our of its depth. It has a fantastic 1×11 drivetrain, initially I was a little concerned that ‘only’ eleven gears would mean that there was huge gaps between them and I would struggle a little to find the right gear. The truth is that ‘only’ eleven gears is more than the 10spd racer that took me thousands of miles as a teenager. The additional truth is that all eleven gear are different and usable. In an 2xn or 3xn systems there are always duplicate gears, a 54/27 is the same as a 42/21 or a 36/18 or any other combination. The lack of duplicates means that all gears are useful. On a 3×10 system you lose four or six straight away as the extreme cross-overs barely work and strain the chain, then you lose another six to eight in duplicates. Probably leaving you with 16 actually usable ratios. Except changing from say 8th to 9th may include changing the front ring too. Which is not that easy to get right. Essentially the 1×11 system may lose a couple of ratio’s, but it gains a lot of accuracy and the silky smooth gear-change is amazing. I am extremely glad that I chose this setup. The brakes, oh my goodness, the brakes. They stupidly powerful and fade-free hydraulic brakes. Many bikes have strong brakes, but these are so easy to modulate – you want to scrub off some speed while heading down a steep gravel-strewn trail ? No problem. Power and control. Utterly lovely. The bike is a hard-tail, which means that the only suspension is up front. 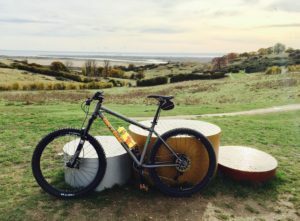 A Rockshox unit with a ton of travel and a lock-out works really well, inflating the air suspension to match my weight and adding some damping means that it is pretty close to perfect, railing at slightly more than sensible speeds over bumpy berms proved how good it is. However, where it really, truly shines is in the technical sections. When you are faced with a steep section that looks slippery, the relaxed geometry means the scary descent is actually pretty simple to navigate. Climbs are also simple, the ridiculously grippy tyres inflated to 28psi just grip and grip. Again, fun and not really too scary at all. The only thing I need to do now is improve my fitness, I ran out of legs after just three laps….